Blossom Music Center once again brings the very best in live entertainment, and this event is no exception! Get ready for one of the biggest Country shows of the year as the one and only – Dierks Bentley takes to the road on his 2017 tour, titled 'What The Hell'! Joining him on the line-up is the equally talented, Cole Swindell & Jon Pardi! Catch this all on Thursday 27th July 2017 – it's going to be a special night! Tickets on sale now, so don't wait around, get yours today! 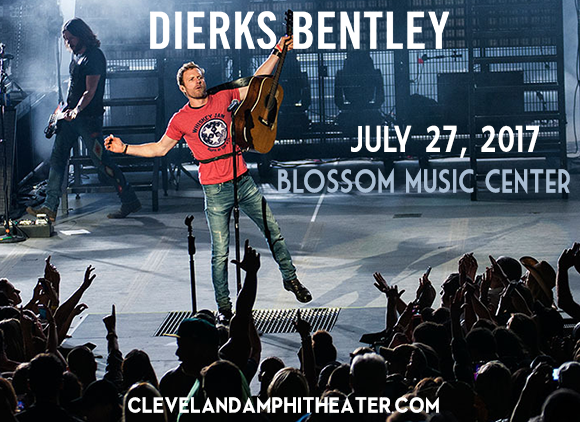 World-wide country sensation, Dierks Bentley has taken the world by storm since his breakthrough onto the mainstream back in the early 2000's! 2003 brought out his first record which would become an instant success through the legendary label, Capitol Nashville. Following this, his second album 'Modern Day Drifter' also went straight to the top of the charts and hit platinum in the United States!